If you lived in the magical land of Warwickshire, England, you would have a fertile countryside to inspire you. Warwickshire, the home of the Noble Bard and Anne Hathaway, is a place where they took the stone from the hills and used them in everything they built, whether it be cottage or castle. The people there joined hands with the land and water to make their living, but they have never forgotten the tall forests and craggy hills that make up their landscape. That is what ambient composer Barbara Hills has used on her recording, Moon and Shadows for inspiration. All twenty four tracks of her two-disc album have titles that could be the names of her favorite photographs or paintings. Each one is a true thing suggesting a snapshot of something beautiful or stimulating or both. Let’s review the music. Barbara Hills loved music at an early age and began composing her own tunes as a teenager. She studied sound engineering at Glasshouse Studios and Music Technology at the Technical Collage in Coventry. She is one of my favorite kind of artists. She is a teacher. She is also a writer of children’s opera, a gifted photographer and a talented paint artist. Hills' music can be categorized as ambient/New Age/Contemporary and of course, Celtic, but she delves into the experimental and electronic from time to time on synthesizer and keyboards. Let’s review the music. Are there deserts in the shire? Probably not, but there are black skies studded with gleaming stars and open expanses represented in Barbara's Desert: Midnight Ride. The tempo is easy going and sure. We are in no hurry. Besides, we have the rising moon to guide us and miles and miles of valleys to explore. Hidden Depths reminds us that not everything can be seen with the eyes. We must use our other senses as well as our hearts to appreciate what is just below the surface of the earth and the soul. The tree has roots, the mountain has bedrock, the spirit has places we do not show to just anyone. Using a bit of sweet voice, Hills gives us the nature tune Winter River. The music has many layers, revealing the crystal crust of new formed ice. We see the murky water racing by and we imagine its cold, cold current. It reminds us that even in the deep of winter, life still flows. It is promising as well. The sun will rejoin us, the ice will melt and spring will bless us again. What is it about a blue sky that inspires the dreamers? Barbara's tune, Indigo is the clear azure firmament that is the background for cloud watching and wish making. I often wonder how the Creator of all things knew that blue would touch our hearts so deeply. The Welsh word for cave or 'hole' is ogo and the ogos have been the subject of folklore in Montgomeryshire for a long time. There are stories of forlorn harpists going into the hole and not coming out, soldiers who hid in the caves and tunnels from everywhere in the shire and back. Caverns starts out dark and foreboding. Barbara uses pipe organ and synth to create an atmosphere of mystery without light. Dare we take the first step? We ask for a story and we get one. Barbara recounts an alluring fairytale in the song Kingdom of the Swan. Celtic mythology is full of stories of swans that experience magical transformations, deal with sibling betrayals, but especially, it is the symbol for the soul. The music is lithe and sweet and we need not worry about a happy ending. It is included. We’ve all taken a walk in the shadowy and scary woods at night and this time we have Barbara's music in the background, a song called Dark and Sleepy Forest. In it the winds blow, the leaves rattle and the branches and limbs crackle. Things calm down a bit, but mystery lurks behind every bush, danger is in the air. As we look out the frosted window, we see the landscape changing before our very eyes. Snowflakes has a twinkling flurry of notes that blanket the senses with a pure whiteness. The scene becomes quiet, clean and so serene. There is something about snow that is cathartic, slowing the heart just enough to count the falling crystal flecks. We are in awe in how they turn everything white. We sever our physical bond with earth and head for the heavens. The tune Leaving Orbit does not take place in a clunky, mechanical rocket ship, but in our own minds. We are weightless, free and drifting toward our favorite star. 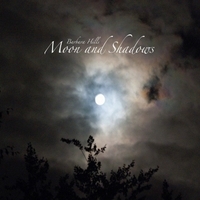 Barbara Hills' album Moon and Shadow give us no less than two dozen opportunities to allow our imaginations to work free of our bodies and observe, fly and soar into her astonishing soundscapes.